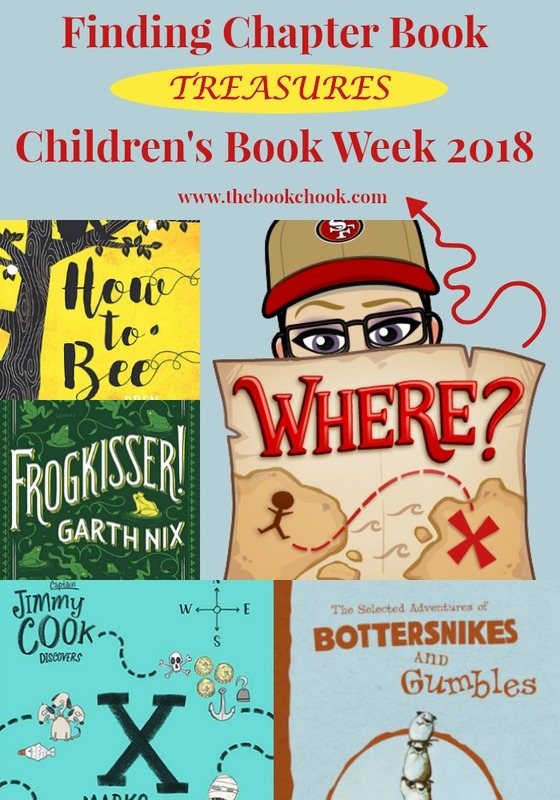 Further to my articles earlier this month, Ideas for Children’s Book Week 2018 and Book Week Activities for Kids 2018, I’ve gathered a list of favourite chapter books I think might suit this year’s Children's Book Week theme: Find your treasure. My first list was about Picture Book Treasures. Today’s list focuses on chapter books. Some have an actual reading or treasure theme, some are on the CBCA Notables list, others I am recommending as possible treasures for a child near you! I’ve also included some treasure-themed free downloads from Gutenberg. The Grand Genius Summer of Henry Hoobler by Lisa Shanahan is a middle grade chapter book and a CBCA Notable for 2018. Shanahan’s writing is elegantly crafted but I suspect kids will be too caught up in the story to notice! They will love the humour, connect so many situations and feelings to their own lives, and by the end of the book, feel as if they understand more about coping with fear. I think this a truly enjoyable and heart-warming story, and hope you’ll recommend it to all the kids you know! Captain Jimmy Cook Discovers X Marks the Spot is a CBCA Notable for 2018. Jimmy Cook is the main character from Captain Jimmy Cook Discovers Third Grade. Jimmy confides in us via his log book that he has made an amazing discovery - something he can’t really help doing, on account of his being probably the greatest explorer who has ever lived. From a dinosaur to potential treasure, from a Time-Travelling Bin Buddy to a valuable ancient Roman coin, Jimmy rockets through life and kids will enjoy the ride. The Seven Treasure Hunts is a junior novel by Betsy Byars. It was published in 1992 but is a fun story if you can find it in your library. The basic idea in this chapter book is that two friends hide treasures and leave clues for each other. I know kids would love to hide some treasure, and work out clues to leave for a friend. Ban this Book is a novel by Alan Gratz. In this novel, Amy Anne and her friends have a big problem when the school board decides to remove books they love from their library. The kids realise that books are treasure and go to great lengths to defend what they see as their right to choose their own books. The Losers Club by Andrew Clements is a novel about the lengths some bookworms go to to be allowed to read in peace! At the end of the book, there is a great list of US classics kids might like to read. Sixth grader Alec can’t put a good book down. So when Principal Vance lays down the law—pay attention in class, or else—Alec takes action. He can’t lose all his reading time, so he starts a club. A club he intends to be the only member of. After all, reading isn’t a team sport, and no one would want to join something called the Losers Club, right? But as more and more kids find their way to Alec’s club—including his ex-friend turned bully and the girl Alec is maybe starting to like—Alec notices something. Real life might be messier than his favorite books, but it’s just as interesting. How to Bee is a middle grade chapter book by Bren MacDibble and is a CBCA Notable for 2018. It’s a great story and one I think kids will find compelling. Peony is a great character. She's the kind of character kids will like and admire, one who keeps talking to a reader well after the book is over. MacDibble has created a very strong voice for Peony, with just enough invented vocabulary to create interest but not to weary. The other characters are very real too. The setting is Australia in a dystopian but not ultra-horrifying world. There are several tense and scary scenes, but I think most kids will take them in their stride. Mr Bambuckle’s Remarkables is a middle grade chapter book by Tim Harris and is a CBCA Notable for 2018. There’s so much humour in Mr Bambuckle’s Remarkables! Kids will feel immediately comfortable in the school setting, and giggle over recognisable characters like a cranky canteen lady or smart-alec student. Young readers will also enjoy the occasional illustration and other features that break up the narrative. For instance, we get to read the students’ app ideas and check out the actual notes passed between Slugger Choppers and Sammy Bamford. The Mapmaker Chronicles is a middle grade chapter book series by A. L. Tait. Many children love to find a series, and this one’s an exciting map-themed series! I love the way Tait allows her characters to speak in modern vocabulary and expressions kids will recognise, because I have read books where the use of dialect and archaic speech has slowed a book right down. On the other hand, I also love the way readers can look through a startled character’s eyes, and experience the mind-boggling wonder, to them, that is a volcano or an elephant. The Selected Adventures of Bottersnikes and Gumbles is a chapter book by S. A. Wakefield with illustrations by Desmond Digby. I consider it an Australian classic. The stories centre around two very different species living in the Australian bush. First of all, we have the Gumbles: cute, fun-loving, squishy, hopeless when they go giggly, and unable to get themselves out of containers they’ve been squashed into. Then there are the Bottersnikes: scaly, green, irascible, lazy and with long pointed ears that go red when they’re angry. How clever the Bottersnikes think they are when they decide to keep the Gumbles as canned slaves, and make them fix up the disgusting rubbish dumps they live in! Frogkisser is a YA fantasy novel by Garth Nix and is a CBCA Notable for 2018. I wasn’t surprised to find myself swept up into an enthralling adventure, punctuated by moments of laugh-out-loud humour. Princess Anya is a delight who must go off on a quest, and is helped/hindered by some very quirky characters. Along the way, Anya learns much more about herself and about the nature of the world she lives in. The Story of the Treasure Seekers by E. Nesbit is downloadable from Gutenberg for free. Treasure Island by Robert Louis Stevenson, illustrated by Robert Ingpen, is published by Walker Books Australia, or is at Gutenberg. Jack and the Beanstalk is at Gutenberg in Childhood’s Favorites and Fairy Stories. Lots of kids will be familiar with this treasure-themed story, so it’s a great one for re-telling. Consider using oral storytelling, improvisation, art/craft, or dance. Have kids look at the story from Jack’s perspective, and then from the Giant’s or another character. Azzi In Between is a graphic novel by Sarah Garland. For some children, “finding treasure” in book format can be discovering something that echoes their own experiences. Find more Children's Book Reviews on The Book Chook by clicking Reviews in the right sidebar. And don’t forget that school and community librarians LOVE to help book treasures get into the right hands!